A lot of people are particular about how they prepare their coffee, so it's a confident company that suggests to them they're doing it wrong. But Nuroast is sure there's a better way to get a great-tasting cup of coffee and demonstrated its prototype home roasting system at the Demo conference on Wednesday. The roaster is based on induction heating -- an efficient and controllable way of converting electrical energy into heat. Nuroast envisages consumers will buy cans of their favorite coffee beans and drop them into the roaster just before they want a cup of coffee. The beans take five to 10 minutes to roast depending on the bean and taste desired. After they're roasted, they're dropped into a coffee grinder just like pre-roasted beans from the supermarket. Because the beans are unroasted to start with and induction allows for a fine level of control, Nuroast says people can make their coffee just the way they like it. It plans to offer several roasting options for each type of coffee, so the same can of beans could produce a light or dark roast depending on preference. The company says it will provide complete information about the source of the beans through a barcode on the cans of coffee it sells to go in the machine. 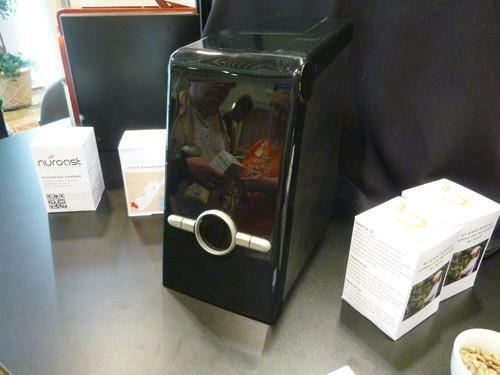 Nuroast expects its roaster to be in production at the end of 2014, said CFO Patrick Deitch. It will cost around US$299, although early adopters can hop on an IndieGoGo crowdfunding campaign launching this week to secure one for $179.